A fantastic way to showcase your wedding ceremony and bridal party is with beautiful wedding programs from Ann's Bridal Bargains. Our selection includes many different designs from stylish and elegant to fun and quirky. 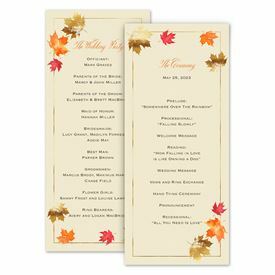 Our wedding programs (also known as ceremony programs) have something to offer every couple, and it's easy to find the right design to coordinate with all of your wedding stationery including your wedding invitations. More importantly, inexpensive wedding programs make it possible for you to get the look and feel you want without having to pay more. Why order wedding programs? Fair question! Especially for couples who are really watching their wedding budgets. First of all, wedding programs are actually very affordable and they add a level of detail to your ceremony that guests really do appreciate. The program acts as a guide of sorts, which allows your guests to feel more familiar with the people involved. This helps guests feel more engaged in the ceremony and lends a more personal feel to your wedding overall. What does a wedding program include? There are three parts to your basic wedding program. 1. The order of ceremony, 2. list of participants and 3. a thank you. Just remember that your program can be whatever you want it to be, so make it as simple or as fun or as elaborate as you want!